This listing is for one spool of clear Stretch Magic Cord bead and jewelry cord, size .8 mm. There is 16 ft (5 meters) of clear stretchy cord on this spool. 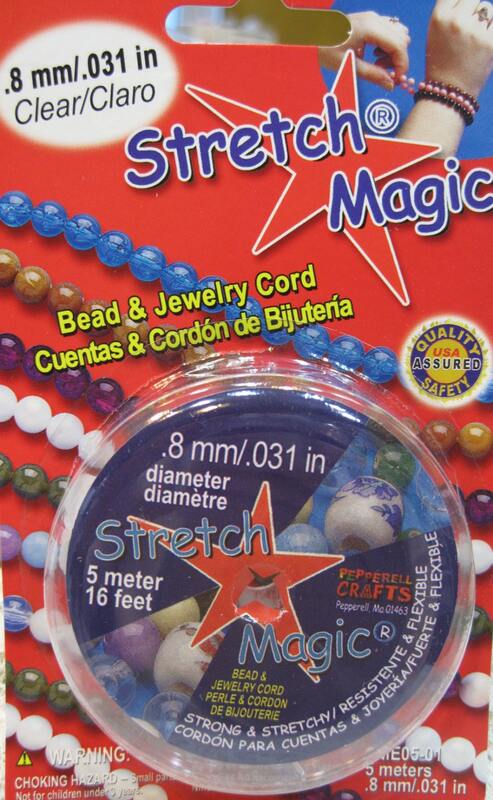 Stretch Magic® jewelry cord is the Worlds number 1 best selling jewelry cord available today! Non fading, resilient, and non cracking, Stretch Magic® makes it easy to wear and remove your jewelry. The ends do not fray so it is super easy to string. When using this cord be sure to stretch the cord before adding beads to prevent it from stretching out later. You will find that this cord is also easy to knot. Finish it off with a series of 3 square knots, and secure the knots with flexible adhesive. I can't wait to use this item to make jewelry!! Great cord - just what I needed! Fast service! Thank you so much!